A seemingly mundane vote on Wednesday intended to help Republicans soften their image on the health care issue laid bare some of the still-raw divisions between the GOP’s pragmatists and the party’s more obstinate ideologues. House Republican leaders were forced to pull a vote on legislation designed as a prime opportunity to fuse conservative priorities with a proposal easily grasped by voters: improving coverage for Americans with pre-existing conditions. Conservative lawmakers fretted that the proposal would perpetuate an element of “Obamacare,” and once again balked at supporting Republican leaders. The situation illustrated, again, the party leaders’ difficulty in managing some of the GOP’s most unruly conservatives. 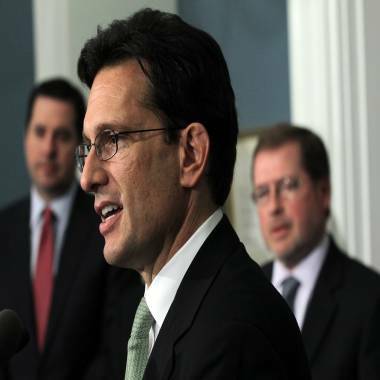 “We, in the House, remain committed to putting our conservative principles first to help people first,” Cantor said at a press conference with fellow Republican leaders. Though President Barack Obama had threatened to veto the legislation, Republicans pursued it nonetheless to notch a positive, campaign-friendly vote for House lawmakers. But Cantor’s office, which sets the schedule for the House floor, was forced to reverse course by Wednesday afternoon, and cancel a planned vote on the legislation when it became apparent that they would lack the necessary votes to advance the bill. (Most, if not all, Democrats intended to oppose the bill, meaning GOP leaders could afford to suffer few defections in their own ranks. “We had good conversations with our members and made a lot of solid progress,” said Erica Elliot, a spokeswoman for House Whip Kevin McCarthy, R-Calif., who explained many House Republicans were set to leave town to attend the dedication of the George W. Bush presidential library on Thursday. The Virginia Republican’s proposal had enjoyed the high-profile support of conservative organizations like Americans for Tax Reform and Independent Women’s Voice, along with several other prominent conservative voices. But the entire ordeal illustrated Republicans’ continued difficulties in finding the sweet spot between conservative consistency and the process of governing – a phenomenon within the GOP that extends well beyond Capitol Hill.